Jay Cutler returns and the Bears post a win. 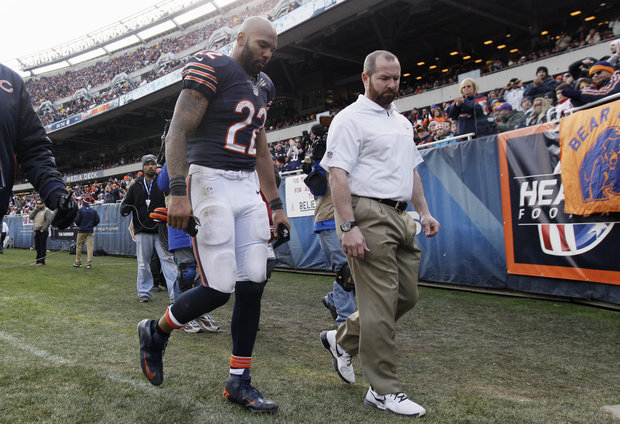 Matt Forte-one of many Bears injured in the win over Minnesota. It was just what the doctor ordered-- Bears 28-10 win over Minnesota at newly sodded Soldier Field. It was a doctor&apos;s final okay that allowed Jay Cutler to get back on the field. There will be plenty of Bears seeing the doctors this week. Snapping a two game losing streak was the best medicine with all the ills this team went through the past week, most notably changing two starters on the offensive line and one on the defensive line. There may be future problems next week with injuries to running back Matt Forte (ankle), guard Lance Louis (knee), cornerback Charles Tillman (ankle), return specialist Devin Hester (concussion) and guard Chris Spencer (knee). When Coach Lovie Smith came to the post-game press conference he had to read all the injuries off a piece of paper. The severity on any of these injuries is unknown at this time. Jay Cutler&apos;s return from his concussion and his play with his favorite target Brandon Marshall was huge. The Bears big wide receiver had 12 catches for 92 yards, allowing him to now have over 1,000 yards (1,017 to be exact) for the season. It was the sixth time in his career Marshall posted those numbers; he even mentioned it to Cutler DURING the game. At his press conference Brandon talked about the feat and his exchange with the Bears QB, “In the third quarter, I leaned over to Jay and said ‘That catch puts me at 1,000 yards for six seasons in a row’ and he looked at me and said ‘You’re disgusting.’ So yes, I’m aware of it." Marshall gave credit to Cutler&apos;s precision during last week&apos;s practices that allowed the Bears quarterback to "thread the needle" with several of his passes. Cutler said he felt no issues with his concussion and credited an offensive line trying to keep him safe. It seemed that it was mostly Jay&apos;s play that allowed the line to perform okay, even after starters got hurt and players like, Edwin Williams and Gabe Carimi were pressed into action. Cutler did some nifty scrambling that set up some scoring opportunities. In particular, when he connected with tight end Matt Spaeth on a 13 yard pass in the second quarter after a Bear interception. There one amusing moment in the huddle, Cutler bent down to tie the shoelace of J&apos;Marcus Webb. The Bears quarterback said he did it to manage the clock better, Cutler also added, "I guess my fatherly instincts were kicking in." Bears running back Matt Forte had a tough day with a fumble in the first series that gave Minnesota an opportunity to get a field goal. Forte&apos;s injury occurred on a play that almost made this game tighter; it looked like he had fumbled allowing Minnesota to get a defensive touchdown. The play was reviewed and overturned, but Forte limped off the field and did not return. His back-up Michael Bush scored two score yard rushing touchdowns with 60 total yards on the ground. The Bears offense did a great job eating up time; they controlled the clock 37:30 to Minnesota’s 22:30. That allowed the defense to be fresh. The Bears defense also rebounded from last week&apos;s disaster on the Bay; Henry Melton greeted Minnesota Quarterback Christian Ponder with a sack on the first play. The defense added to their NFL leading take-away total with two fumbles and an interception, they have 33 for the season. 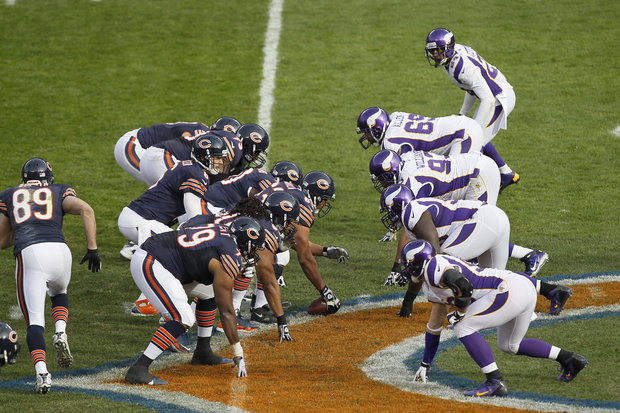 Although the Bears “D” gave up 108 yards to Minnesota’s Adrian Petersen, most of those came late in the game. Petersen did fumble twice. The Vikings had lots of problems trying to establish their offense. Christian Ponder was only sacked twice, however, he was harassed most of the game. Julius Peppers recorded his 12th career field goal block when he batted down Vikings kicker Blair Walsh’s 30 yard attempt in the 2nd quarter. And Adam Podlesh was successful running in a two point conversion after a Bears touchdown in the 2nd quarter. It was an important win over a divisional opponent the Bears improve to 8-3 and Minnesota falls to 6-5. This will be an interesting week at Halas Hall trying to figure out who is available for Sunday’s home game against Seattle. Its that time of year where injuries will start to take its toll and good back-ups are valuable. Follow Cheryl on Twitter @CRayeStout and Facebook Cheryl Raye-Stout #AtTheGame.